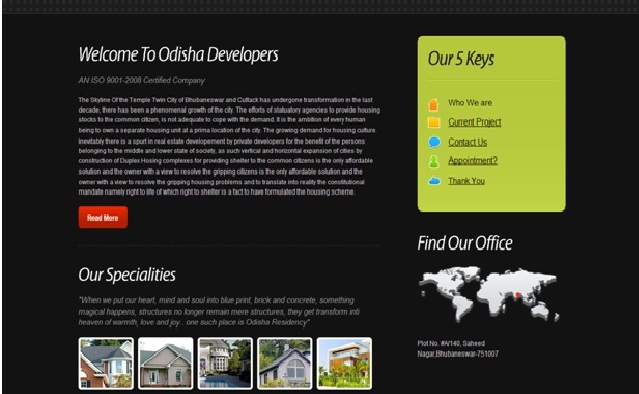 Odisha Developers is a magnificent infrastructure development company located in the temple city Bhubaneswar, Odisha. This company is committed to provide all types of housing projects like housing plots, simplex, duplex, apartments, villas, farm houses and commercial complexes in the best locations of the city. This company has a highly experienced team such as quality civil contractors, best supervisors, best architects, sales managers, marketing managers, hr executives, and other official employees. This project is located at IIT Argul, Khurda, Odisha. This project provides low and affordable budgetted plots to all the categories of the people with all modern facilities. This project is located in front of the MIT (Maharaja Institute of Technology) and back side of Star engineering college. This project is a distance of 5 kms from khurda railway station, 3 kms from NISER, 1.5 kms from ICFMD, walkable distance from IIT, Close to Jatni market and connected to khurda-puri bypass. This project is going under 20-30 Bhubaneswar master plan. This project is located at Balakati, Bhubaneswar, Odisha. This project provides all the modern facilities like 30 feet and 20 feet road connected with each plot, pollution free area, green atmosphere, space for childern’s park, jogging track, open space for temple, market complex, school, and get immediate registration facility. This project also provides installment facilities to the middle class people with home loan facilities from reputed banks. This project is a distance of 15 kms from uttara chhak, 3 kms from nimapada road, 500 metres from Trahi Achuta Asram and very nearer to Jheenti Chhak. This project is located at Nijigarh Kurki, Bhubaneswar, Odisha approved by BDA (Bhubaneswar Development Authority). This project provides so many facilities like ECO-friendly environment, Educational institutions like KG to PG, 80ft main road and 20 ft sub road connected to every house plot, Park, Temple, Market, Complex, School, Jogging track etc. this project is a distance of 10 kms from Biju patnaik airport, 12 kms from Bhubaneswar railway station, and besides Orissa Engineering College.